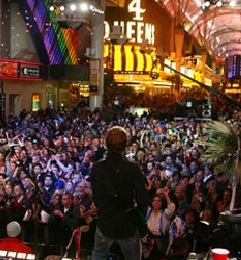 Official site of The Fremont Street Experience is where to get Today's entertainment schedule as well as a calendar of events. 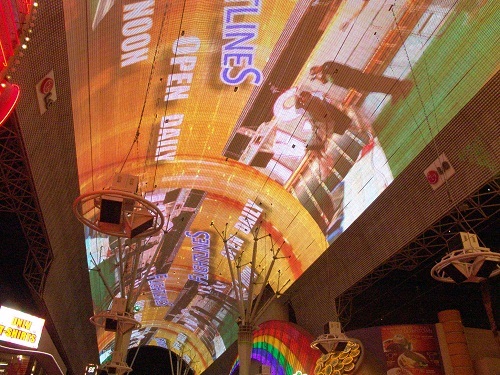 Opened in 1995 The Fremont Street Experience saved Downtown from being totally forgotten. Since then most will agree that Downtown is definitely worth the short transit from the Strip. 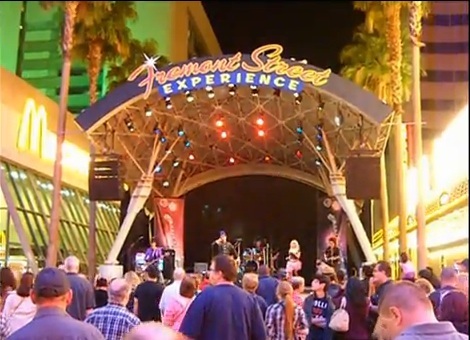 There is a wide range of free entertainment at the Downtown Fremont Street Experience. Most of the year Sunday - Thursday You will find Carl Ferris on the sax and the light and sound system of the venue with maybe a local act or two. On Friday and Saturday or on Holidays, You might find a major name or a somewhat well known act. I warn You, if the band or act is nationally known, the audience will be maybe bigger than You want to be a part of. There are a lot of good bands that play that are not so well known and will not draw an uncomfortably large crowd. The crowd above is typical of good bands. These crowds allow You to move around, get a drink, use the restroom and come and go. The bigger nationally or worldwide known acts can be so crowded You cannot move. Just be prepared to not be able to move until the show is over. 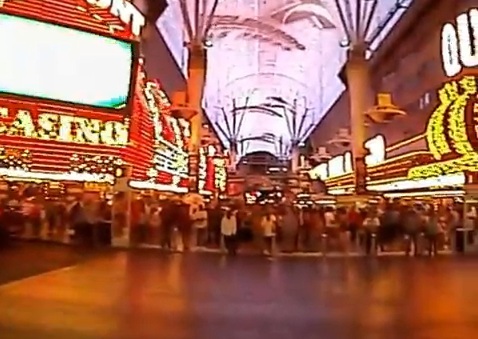 Enjoy the videos below of some of the Fremont Street Entertainment. Carl Ferris is an amazing talent. Every sound you hear on these videos is produced by him only. 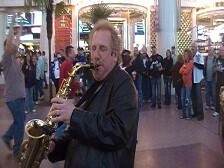 He is actually playing the sax through the gigantic sound system of the Fremont Experience, its a must see free thing to do in Vegas. have a job He just loves to perform. your picture taken with Him even as he plays. Video of Fremont Experience "Who do you love"
Video of Fremont Experience "Bad to the Bone"
Video of Fremont Experience "Time of the Season"
Video of Fremont Experience "No one told me about Her"